College leadership is thinking hard about ways to take diversity and inclusion efforts to a higher level - beyond hiring and admissions targets, beyond overused platitudes and PowerPoint slides, and into a true sense of belonging for every person involved with the College of Veterinary Medicine. Pictured here, the college community celebrates National Coming Out Day. 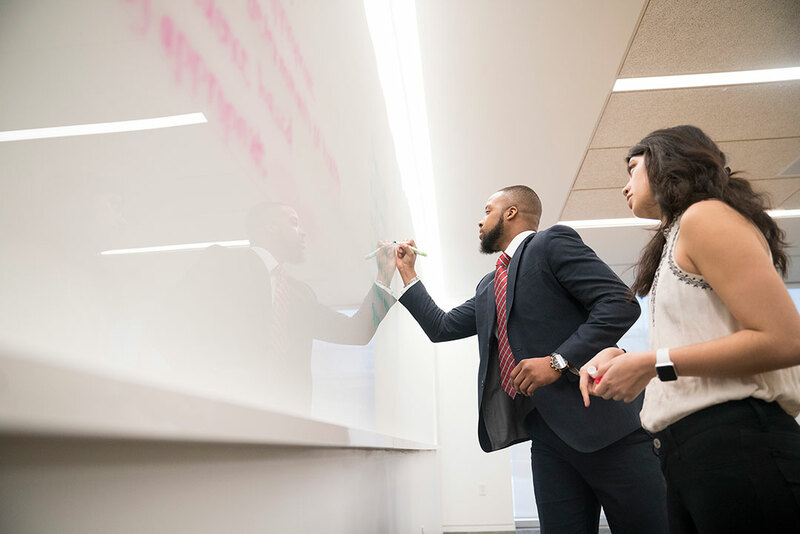 Diversity and inclusion: two words used frequently in organizational discussions, mission statements and national dialogues around policy and politics. With so much mention, the words can run the risk of losing meaning. Yet they represent values that have shaped Cornell — an institution where “any person can find instruction in any study.” The College of Veterinary Medicine has aimed for that vision — albeit with failings and flaws along the way — throughout its history. Today, the college continues to strive for a leadership role in diversity and acceptance — a complex undertaking considering its placement in a region and industry that are both considerably non-diverse. However, for Lorin Warnick, D.V.M., Ph.D. ’94, the Austin O. Hooey Dean of Veterinary Medicine, and the rest of the college community, it’s a challenge worth fighting for. The demographics of the CVM student body have changed substantially through the eras. Above: Florence Kimball, the first American woman to be granted a veterinary degree, awarded to her by CVM in 1910. 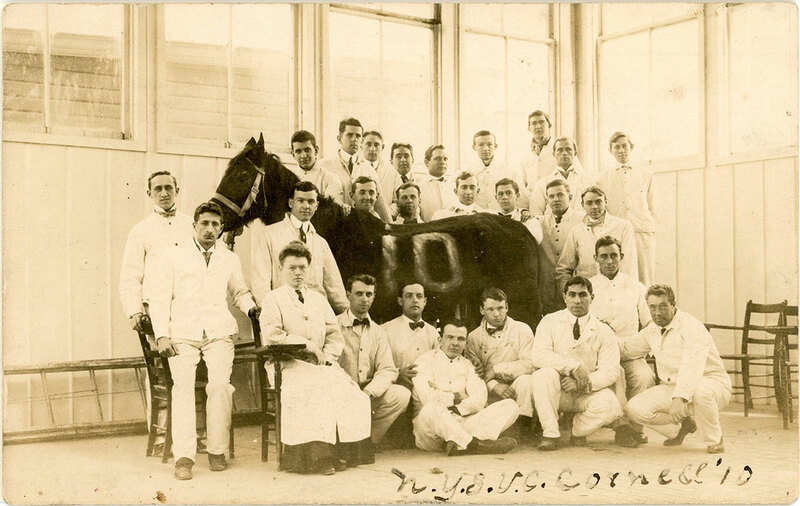 In 1910, the college awarded the first veterinary degree to an American woman, Florence Kimball. While Kimball is a badge of pride for CVM, it is marred by the fact that up until 1970, only a small number of seats were made available to female applicants. Mary Smith, D.V.M. ’72, professor in the Department of Population Medicine and Diagnostic Sciences, recalls her application process to the college. “After fifty-eight men had been selected, four women were summoned to the Hagan Room,” Smith says. “We were told, ‘Two of you we will accept and two we will reject,’ and one at a time we were called out for an interview.” Times changed. New admission policies caused a 500 percent increase in women admitted to Cornell between 1971 and 1977, and today, roughly 75 percent of the college’s graduates are female, reflecting the overall trend in the industry where over two-thirds of veterinarians are now women. The college was also one of the first two in the country to admit the most African American students before 1920, conferring a Ph.D. to Frederick Douglass Patterson who would go on to become president of Tuskegee University, develop the Tuskegee Airman Program and found the Tuskegee veterinary college. Today, under-represented minorities (known as URMs and include African Americans, Native Americans and Latinos) make up about 19 percent of the college’s veterinary student body. The incoming class this fall will be 23 percent. Currently, 30 percent of American citizens identify as URMs, and are estimated to be up to 40 percent by the year 2050. “We’d like our college to more fully reflect the national population as a whole,” says Warnick. 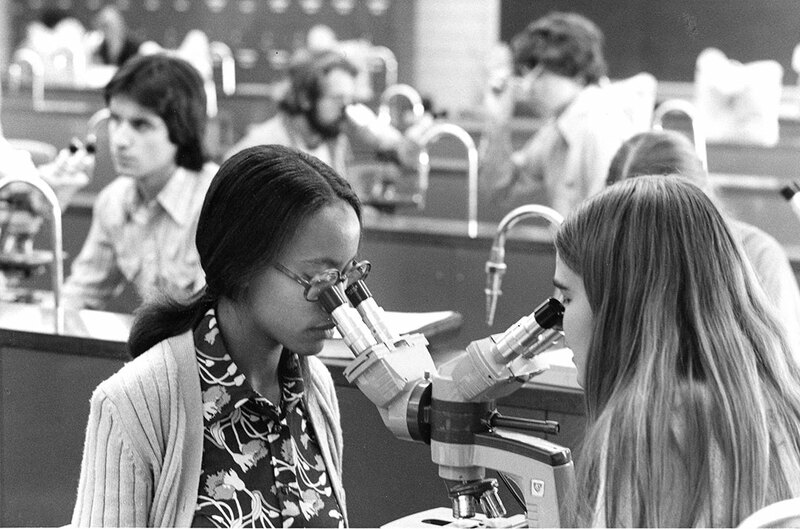 Two students in a pathology lab in 1976. These facts are not lost on the national leadership in the veterinary field. In 2005, the Association of American Veterinary Medical Colleges (AAVMC) launched an initiative to increase diversity at American veterinary colleges, which bumped URM enrollment up from 9.7 percent to 14.6 percent over ten years. “We have tangible benefits when there’s diversity in this community — and I mean diversity in every sense of the word." In line with this initiative, Cornell University and the veterinary college have also implemented strategic programs to boost diversity. In 2011, the college launched its Veterinary College Diversity Committee, an expansion from the Faculty Affirmative Action Committee created in 1998. The new committee, which now included staff and students in addition to faculty, was created to foster inclusion throughout the college. In 2012, Cornell University enacted the Towards New Destinations program, which mandated that each college aim for measurable results in composition, engagement, inclusion and achievement across all constituent groups, including veterinary and graduate students, faculty, staff and more. 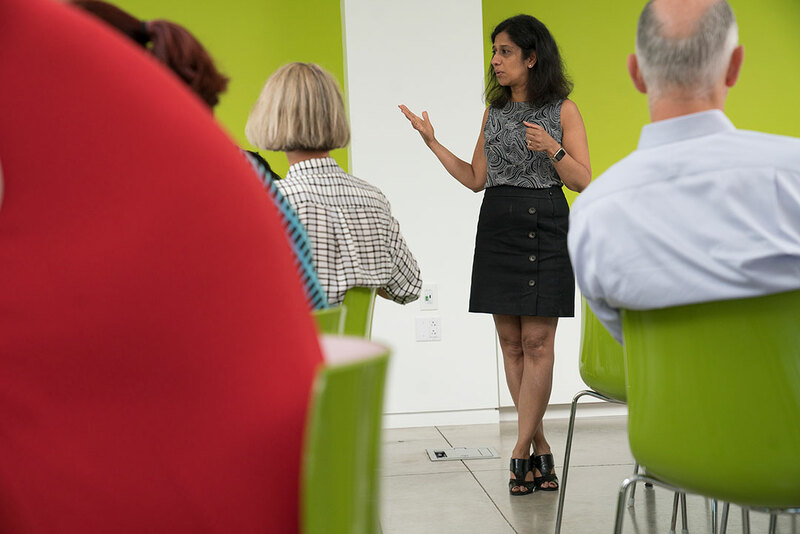 In terms of faculty and staff diversity, “This works on top of the college’s annual affirmative action efforts,” explains Toral Patel, college HR generalist and member of the Veterinary College Diversity Committee. “The university analyzes the compositional diversity of its workforce by job group, comparing that to the demographics data of qualified talent available. This analysis helps us develop proactive recruitment and retention strategies, and to identify and eliminate any unconscious bias in the employment process.” CVM’s HR department has also overseen the adoption of gender-neutral bathrooms at the college, and encourages college members to work with diverse contractors whenever possible. The college’s veterinary students have also kept a steady drumbeat of diversity efforts. Cornell had the first chapter of Veterinary Students One in Ethnicity and Color (VOICE), which promotes and fosters cultural diversity at CVM and in the profession as a whole, and organizes guest and social events for students of color. The Vets for Diversity (also known as the Homophiliacs) unites LGBTQ members of the college community with support and social events. Students of the Masters of Public Health Program. 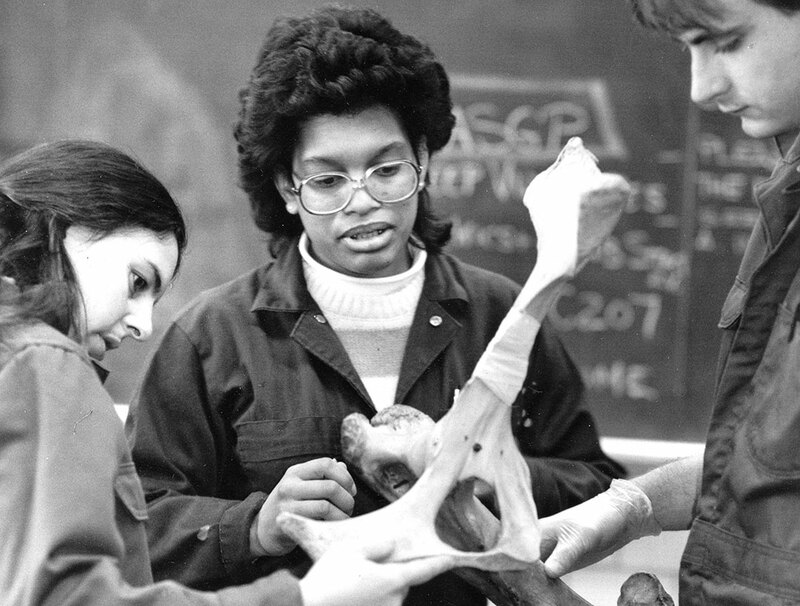 Students examine a horse hindlimb skeleton in 1984. With the national and local upheaval, the college had a collective desire to expand its identity into one that valued personal experience, identities and sensitivities along with its traditional focus on empirical data and clinical outcomes. Those conversations are now in full swing, thanks to the Many Voices, One College series that began in January 2018 and features a combination of lectures and informal discussions focusing on diversity and inclusion. While the college had already been routinely hosting talks on diversity, this series marks a more dedicated and regular effort. Lectures have included “Black Lives Matter, Blue Lives Matter, All Lives Matter,” facilitated by Cornell Woodson, diversity and inclusion programs lead in the Department of Inclusion and Workforce Diversity, who dove head-first into discussing these slogans while encouraging attendees to open up with their own thoughts and feelings about them. Another talk, “Tackling Impostor Syndrome,” featured activist and educator Dena Simmons from the Yale Center for Emotional Intelligence, who discussed how emotionally intelligent and culturally responsive practices can help to tackle impostor syndrome and create equitable and welcoming communities for all. Sara Xayarath Hernández, M.R.P. ’07, associate dean for inclusion and student engagement in the Graduate School, also spoke to the college as part of the program. This fall, the series will host speaker Dr. Jaron Jones, director of diversity and inclusion at the University of Florida College of Veterinary Medicine. "There was a real desire to talk about and acknowledge what was taking place. People's lives were being impacted on a daily basis by these current events." “The fact that these events are regular and informal has really worked to build a community,” says diversity committee member and Associate Dean for Academic Affairs Dr. Susan Fubini. 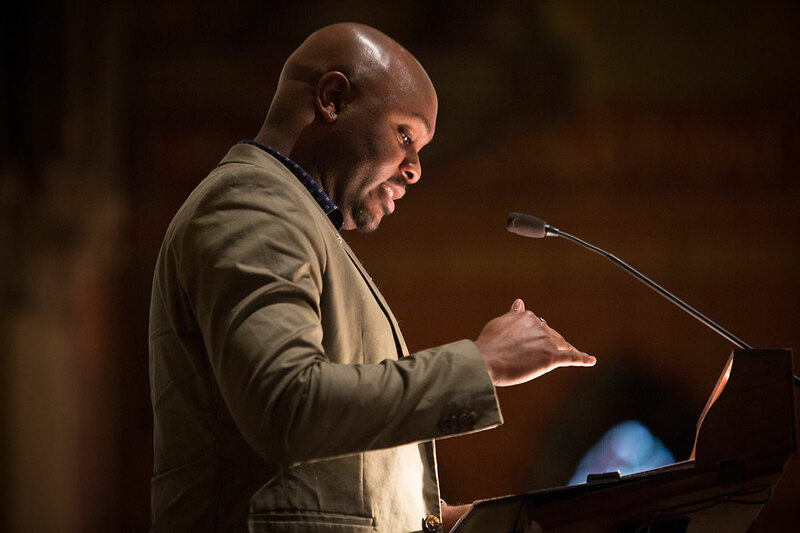 Cornell Woodson, diversity and inclusion programs lead in the Department of Inclusion and Workforce Diversity, who dove headfirst into discussing diversity issues in the college's Many Voices, One College series. Photo by University Photography. Lack of diversity isn’t just a veterinary medicine problem. Academic science departments struggle to reflect a representative number of minorities in their ranks as well. A 2018 study in Plos ONE found that, of students earning a bachelor’s degree in biological sciences, 60 percent are white while 18 percent are URM. Additionally, out of all high school graduates who express an interest in biological or agricultural sciences and then persist from interest to a degree, 46 percent are white, while 25 percent are URMs. Other recent studies found that URMs are only earning 12 percent of doctoral degrees awarded, and make up just 11 percent of post-doctoral researchers. “It’s pretty striking that the higher you go up in the academic hierarchy, the fewer URMs there are,” says Aguilar-Carreno. The college is faring better than the nation-wide numbers in terms of its graduate student demographics; 26 percent of current students within the colleges Biological and Biomedical Sciences (BBS) Ph.D. program identify as URM, and 33 percent of the incoming class of 2018 Ph.D. students are URM as well. The numbers of URMs in the college’s faculty will hopefully get a boost thanks to a new grant program run by Aguilar-Carreno and Associate Professor of Immunology Cynthia Leifer, Ph.D. '00. Funded by the National Institute of Allergy and Infectious Diseases (NIAID), the program specifically aims to increase the level of success of URMs in Cornell faculty that are working human allergy and infectious disease research. 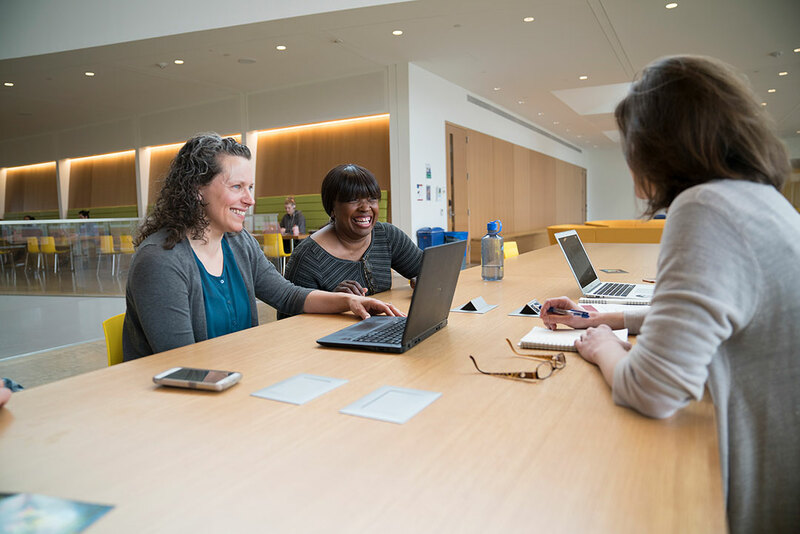 To do this, Aguilar-Carreno and Leifer’s program will have three goals: mentoring junior URM faculty, training URMs in grant writing and bringing more URM post-doctoral researchers to Cornell with the aim of recruiting them to eventual faculty positions. These targeted efforts will tackle a key attrition point in the advancement of URMs in scientific academia — the jump from post-doctoral training into tenure track positions. 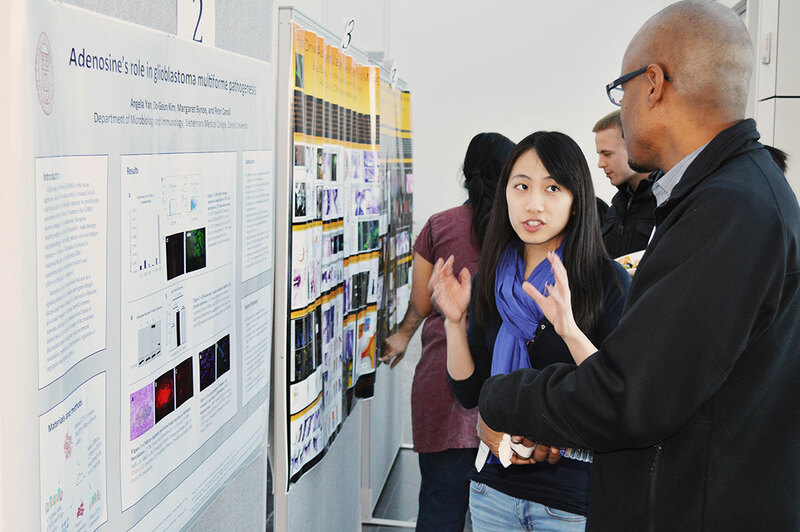 At the Biological and Biomedical Sciences Symposium, a student discusses her research with Dr. Avery August, professor and vice provost for academic affairs. Aguilar-Carreno can personally identify with the story told by the statistics. As a graduate student at the University of Southern California, he faced not only a rigorous research and academic workload, but a language barrier as well, having moved from Mexico after his undergraduate degree. “I really struggled,” says Aguilar-Carreno. “My peers had the writing and social skills that I didn’t have yet. I almost didn’t graduate.” His academic performance was suffering so much that his a member of his advisory committee publicly stated that they didn’t think he was going to graduate. “I was really devastated by that,” he says. Luckily, Aguilar-Carreno’s deep motivation spurred him to compete his graduate work, and he’s since gone on to lead a highly successful research lab conducting foundational studies on some of the world’s most deadliest viruses. 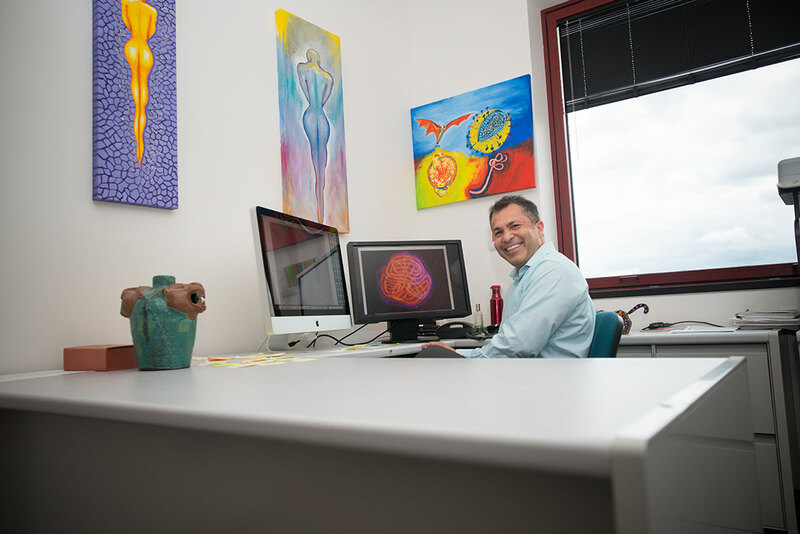 Dr. Hector Aguilar-Carreno, associate professor of microbiology and immunology and chair of the CVM Diversity Committee. Photo by Rachel Philipson. While the grants and programs led by college and the university answer part of the issue around flagging diversity numbers, the issue of inclusion and integration is harder to solve. A 2011 survey of all veterinary students done by the AAVMC showed that that almost a third of racial and ethnic minority students had experienced racism, mostly from other students. Additionally, 20 percent of LGBT students have heard homophobic slurs in the academic environment. Students with disabilities also reported feeling alienated. Even without directly harmful acts, subtle and often unintentional assumptions and statements (often referred to as “microaggressions”) can erode a person’s sense of belonging and respect. "Cultural divides happen because we don't try to get to know each other. We want to inspire people to make new relationships with people who are different from themselves." - Dr. Hector Aguilar-Carreno, associate profesor of microbiology and chair of the CVM Diversity Committee. To take the mission beyond the blueprint, the college has begun to seriously tackle issues like unconscious bias and microagressions in the classroom and beyond. The MPH program has cultural competency and social justice baked into the curriculum through courses such as the Public Health Leadership and Ethics course and the Public Health Foundations courses, which focus on the social and structural determinants of health and one health and planetary issues. The college has hosted these kind of pivotal trainings within its own halls. In 2016, the college was formally recognized as a role model in supporting and promoting LGBTQ+ initiatives and advocacy within the Cornell University community for their LGBTQ seminar series which included ‘Safer People, Safer Places,’ which covered sexuality, homophobia, heterosexism and ways to create an inclusive space; and ‘Trans 101,’ which explored issues and processes faced by transgender individuals. In additional efforts, the college has invited the Cornell Interactive Theater Ensemble to enact scenes where these incidents occur between actors, and then facilitate discussions with the audience afterwards. “It was wildly successful in the Department of Clinical Sciences,” says Fubini. “Everyone really got a lot out of it. I think it really shows us that we all have unconscious biases, and we need to work on being aware of them.” Plans are in motion to present the program to other units within the college. Jai Sweet, Ph.D. '96, director of student services and multicultural affairs, leading a session of the college's diversity and inclusion discussion series Many Voices, One College. With the next academic year on the horizon, college leadership is thinking hard about ways to take diversity and inclusion efforts to a higher level — beyond hiring and admissions targets, beyond overused platitudes and PowerPoint slides, and into a true sense of belonging for every person involved with the College of Veterinary Medicine. "I want to get to a point where we don't have to define what diversity is and make a case that it's important. I want it to be so ingrained in our community as a whole, so we can move forward with more nuanced trainings and goals." The journey to that goal for the college continues. Plans are in place to host graduate student discussion sessions around acceptance and identity. The college will also host “My voice, my story,” a film and discussion program featuring personal struggles of graduate and professional students. Future trainings will cover unconscious bias and intergroup dialogues that touch on difficult conversations. Gen Meredith (left), associate director of the MPH Program, and Toni Thibeaux, MPH program coordinator, sit with the MPH group in the college atrium. This story was originally published as a feature in the summer 2018 issue of 'Scopes.